For the film, see The Governess. A governess is a woman employed to teach and train children in a private household. In contrast to a nanny (formerly called a nurse), she concentrates on teaching children instead of meeting their physical needs. Her charges are of school age rather than babies. The position of governess used to be common in well-off European families before the First World War, especially in the countryside where no suitable school existed nearby. Parents' preference to educate their children at home—rather than send them away to boarding school for months at a time—varied across time and countries. Governesses were usually in charge of girls and younger boys. When a boy was old enough, he left his governess for a tutor or a school. Governesses are rarer now, except within large and wealthy households or royal families such as the Saudi royal family and in remote regions such as outback Australia. There has been a recent resurgence amongst families worldwide to employ governesses or full-time tutors. The reasons for this include personal security, the benefits of a tailored education, and the flexibility to travel or live in multiple locations. Traditionally, governesses taught "the three Rs" (reading, writing, and arithmetic)  to young children. They also taught the "accomplishments" expected of middle-class women to the young ladies under their care, such as French or another language, the piano or another musical instrument, and often painting (usually the more ladylike watercolours rather than oils) or poetry. It was also possible for other teachers (usually male) with specialist knowledge and skills to be brought in, such as, a drawing master or dancing master. The governess occupied a uniquely awkward position in the Victorian household, because she was neither a servant nor yet a member of the host family. She worked in the upper-class home of the landed gentry or aristocracy. She herself had a middle-class background and education, yet was paid for her services. As a sign of this social limbo she frequently ate on her own, away from the rest of the family and servants. By definition, a governess was an unmarried woman who lived in someone else's home, which meant that she was subject to their rules. In any case, she had to maintain an impeccable reputation by avoiding anything which could embarrass or offend her employers. If a particular governess was young and attractive, the lady of the house might well perceive a potential threat to her marriage, and enforce the governess's social exclusion more rigorously. As a result of these various restrictions, the lifestyle of the typical Victorian governess was often one of social isolation and solitude, without the opportunity to make friends. The fact that her presence in the household was underpinned by an employment contract emphasized that she could never truly be part of the host family. However, being a governess was one of the few legitimate ways by which an unmarried middle class woman could support herself in Victorian society. Not surprisingly, her position was often depicted as one to be pitied, and the only way out of it was to get married. Unfortunately, it was difficult for a governess to find a suitable husband because most of the eligible men she encountered were her social superiors, who preferred a bride from within their own social class, particularly since such women generally had better financial resources. Once a governess's charges grew up, she had to seek a new position, or, exceptionally, might be retained by the grown-up daughter as a paid companion. An option for the more adventurous was to find an appointment abroad. The Russian Empire proved to be a relatively well-paid option for many. According to Harvey Pitcher in When Miss Emmie was in Russia: English Governesses before, during and after the October Revolution, as many as thousands of English-speaking governesses went there. As English became the fashionable language of choice among the aristocracy during the later days of the regime, clearly they were displacing opportunities formerly spread more across the French-speaking world. The estimate of numbers ('thousands'), although necessarily vague, is justified by some knowledge of the main lodging house used by those not accommodated with their host families, St. Andrew's House, Moscow, and by the places of worship they preferentially frequented, for example the church associated with the House. Pitcher drew extensively on the archives of the Governesses' Benevolent Institution in London; there is also some allusion to the phenomenon of governesses being engaged abroad in A galaxy of governesses by Bea Howe. Katherine Swynford, governess to the children of John of Gaunt, and later became his mistress, the mother of his Beaufort children, and his duchess. She was a great-great grandmother of Henry VII of England through his mother Lady Margaret Beaufort. Margaret Pole, Countess of Salisbury, governess to the future Queen Mary I of England. They were also third cousins (Mary's paternal grandmother Elizabeth of York was first cousins with Margaret Pole (their fathers Edward IV and George Plantagenet, 1st Duke of Clarence, 1st Earl of Salisbury, 1st Earl of Warwick KG were brothers). Kat Ashley, governess to Queen Elizabeth I of England. Madame de Maintenon, who became the last mistress of Louis XIV of France, gained entry to his inner circle as governess to his illegitimate offspring, the children of Madame de Montespan. Mary Wollstonecraft (1759-1797), author of the early feminist classic A Vindication of the Rights of Woman, worked as a governess in the household of the Anglo-Irish Kingsborough family, where she greatly influenced Margaret King. Jane Gardiner (1758-1840), from her mid-teens governess to the daughters of Lady Martin, and from 1780 to the children of Lord Ilchester. She was succeeded in this second post by Agnes Porter, whose memoirs were reprinted in 1998 as A Governess in the Age of Jane Austen. Baroness Louise Lehzen and Charlotte Percy, Duchess of Northumberland, governesses to the future Queen Victoria. Anne Sullivan, the so-called Miracle Worker, who educated the remarkable deaf and blind girl Helen Keller. Anna Leonowens, governess to the harem of Mongkut (monarch of what is now Thailand). Her memoirs were later novelised as Anna and the King of Siam, which in turn inspired the musical drama The King and I.
Marie Curie, who worked as a governess in multiple households to fund her education, later became one of the most influential women in the history of science. Marion Crawford ("Crawfie"), governess of Queen Elizabeth II and Princess Margaret. Maria von Trapp, the real-life inspiration for "The Sound of Music". Several well-known works of fiction, particularly in the nineteenth century, have focused on governesses. Jane Austen's novel Emma (1815) opens with the eponymous heroine losing Miss Taylor, the governess who had become a family companion, to marriage with Mr. Weston. Later, Jane Fairfax feels the threat of being forced to become a governess if her covert attachment to Frank Churchill all comes to nothing. Mary Martha Sherwood wrote The Governess, or The Little Female Academy in 1820. 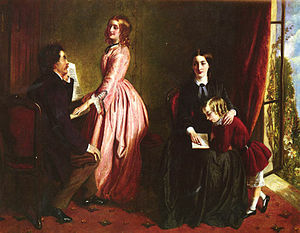 Jane Eyre, the protagonist in Charlotte Brontë's novel of that name (1847), serves as a governess to the ward of her future husband, Edward Fairfax Rochester. Becky Sharp, the main character in William Makepeace Thackeray's novel Vanity Fair (1847–48), is employed as a governess. Madame de la Rougierre is the wicked and mentally unbalanced French governess to heiress orphan Maud Ruthyn in Joseph Sheridan Le Fanu's gothic novel Uncle Silas (1864). Stiva, the brother of the eponymous heroine in Anna Karenina (1878), had an affair with his children's governess. Henry James's most famous governess is the over-sensitive and perhaps hysterical protagonist in The Turn of the Screw (1898). Two of the Sherlock Holmes stories tell the tales of governesses: Violet Hunter, in "The Adventure of the Copper Beeches", and Violet Smith, in "The Adventure of the Solitary Cyclist". In addition, Mary Morstan, the wife of Dr. John Watson, used to be a governess. Dante serves as governess to Stephen Dedalus and his siblings in James Joyce's A Portrait of the Artist as a Young Man (1916). In Winifred Watson's novel Miss Pettigrew Lives for a Day (1938), the title character is a life-long governess who unexpectedly finds other employment. Terry Pratchett's Discworld series features a governess named Susan Sto Helit. Eva Ibbotson's children's novel Journey to the River Sea (2001) features Arabella Minton as governess to the main character. In Libba Bray's Gemma Doyle Trilogy (2003-2007), the title character’s orphaned friend is brought up to be a governess. Diane Setterfield's gothic suspense novel The Thirteenth Tale (2006) develops parallels with Jane Eyre, including the role of the governess. The Governess is a 1998 British period drama film written and directed by Sandra Goldbacher. Maggie Evans/Victoria Winters is hired to be governess to David Collins in the 2012 film Dark Shadows. Miss Mary (1986) stars Julie Christie as the eponymous English governess in pre-Peron Argentina. Soap opera Dark Shadows featured the character Victoria Winters as the governess to David Collins. The term "governess" is an archaic gendered job title for a politician; now the word "governor" is used for men or women. For example, Keʻelikōlani was known as the governess of Hawaii. Anne Hegerty, one of the Chasers on the British and Australian versions of The Chase, is nicknamed "The Governess". ^ A Governess's Duties, Outback House (Australian Broadcasting Corporation). ^ Ellis, Phyllis (2000). Desert Governess: An Inside View on the Saudi Arabian Royal Family. London: Eye Books. ISBN 1-903070-01-5. ^ McDonald, James Joseph, and J. A. C. Chandler (1907). Life in Old Virginia; A Description of Virginia More Particularly the Tidewater Section, Narrating Many Incidents Relating to the Manners and Customs of Old Virginia so Fast Disappearing As a Result of the War between the States, Together with Many Humorous Stories. Norfold, Va: Old Virginia Pub. Co. p. 241. ^ Estreicher, Tadeusz (1938). "Curie, Maria ze Skłodowskich". Polski słownik biograficzny, vol. 4 (in Polish). p. 112. ^ Staley, Thomas Nettleship (1868). Five Years' Church Work in the Kingdom of Hawaii. p. 108. Retrieved 31 October 2016. ^ "The Chase - Meet the Chasers". Bradley Walsh. Retrieved 28 July 2014. 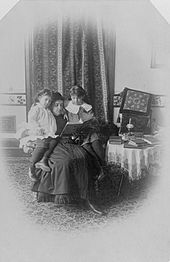 Wikimedia Commons has media related to Governesses.